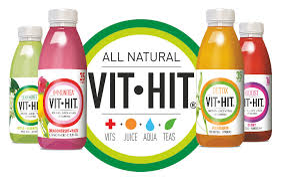 VitHit -drinks are now supplied by us. Fresh Irish wellness drink continues to conquer the world! One bottle (500ml) has 100% RDA of 8 vitamins, and only 35 calories. Fruit juice from nature combined with fresh spring water and health beneficial tea and vitamins ensures a great boost to the season. No added sugar! Four flavors bring variation and the bright colors are flashy in the store shelves, reinforcing the strongly growing category of wellness drinks!